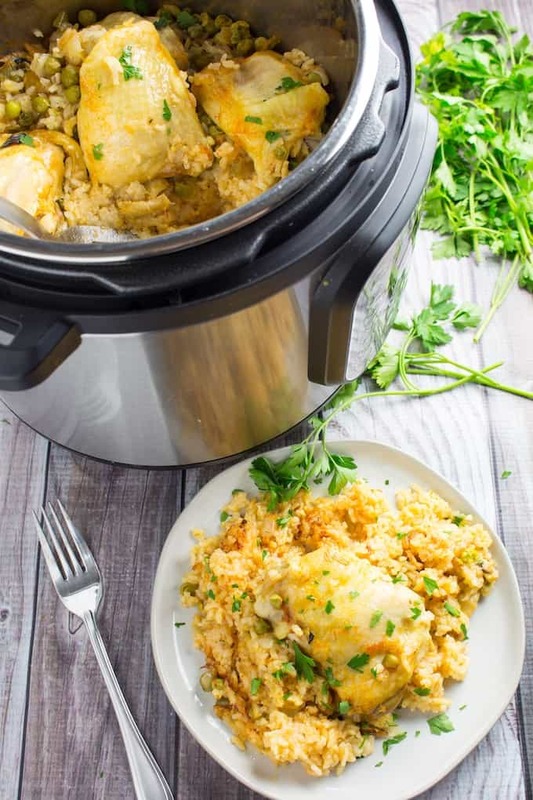 Instant Pot Chicken and Rice is a quick and easy pressure cooker dinner that’s perfect for weeknights, made with rice, salsa, veggies, and chicken thighs, ready in under 45 minutes! I love making quick and easy dinners, and right now I’m completely obsessed with my Instant Pot. This week I’m making Instant Pot Pork Loin Roast (Pressure Cooker), Instant Pot Pork Chops, and Instant Pot Pot Roast with Carrots & Potatoes! 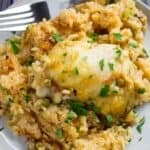 Instant Pot Chicken and Rice is one of my all-time favorite pressure cooker recipes. Not only is it insanely easy to throw together on a weeknight when you get home from work, but the ingredients are also super cheap! I make this Spanish rice with just rice and a jar of medium heat salsa, add some veggies, and let the chicken cook on top so the juices can fall down and flavor the rest of the dish. You can use whatever vegetables you have, personally I like peas, but I’ve also done this with mushrooms, broccoli, and squash. How do you cook white rice in the instant pot? White rice is quick and easy in the instant pot. If you’re going for plain white rice, just add the one cup of rice per one cup of liquid (water or gluten free broth). If I’m making plain rice, I’ll add some salt and a tablespoon of butter to the pot for flavor. Then close the instant pot lid, lock the pressure valve, and cook 12 minutes on high, then naturally release. This is the same amount of time I set the chicken for once we add that, too. Once your rice is done, fluff it with a fork and serve! You can top it with some chopped parsley or cilantro if you want to. Can you cook frozen meat in the instant pot? The answer is yes and no. These chicken thighs should be fine in the instant pot, along with chicken breast or ground meat. A larger cut of meat, like a roast, might have issues in the instant pot, so I’d recommend defrosting it in the refrigerator either the night before or in the microwave on the defrost setting. 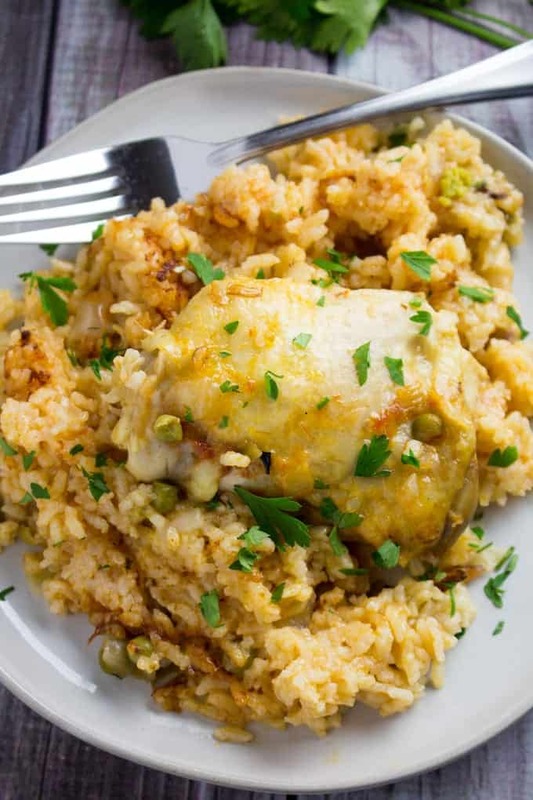 If you’re using frozen chicken thighs for this instant pot chicken and rice, I would recommend adding an additional 2-5 minutes to the time, just to make sure it’s cooked through. Chicken is done when it reaches an internal temperature of 165F. How do you fix mushy rice in the instant pot? If your rice turned out mushy, you probably used too much water when cooking. I’ve also done this by adding frozen vegetables and particularly juicy cuts of meat, that released too much water. You can fix this problem by turning on the sauté feature, and stirring the rice continuously, to cook off the extra water. Be careful, the pot gets really hot so it will be easy to burn the rice if you’re not watching it closely! This recipe calls for chicken thighs, but you can use chicken breast or chicken quarters if that’s what you have. 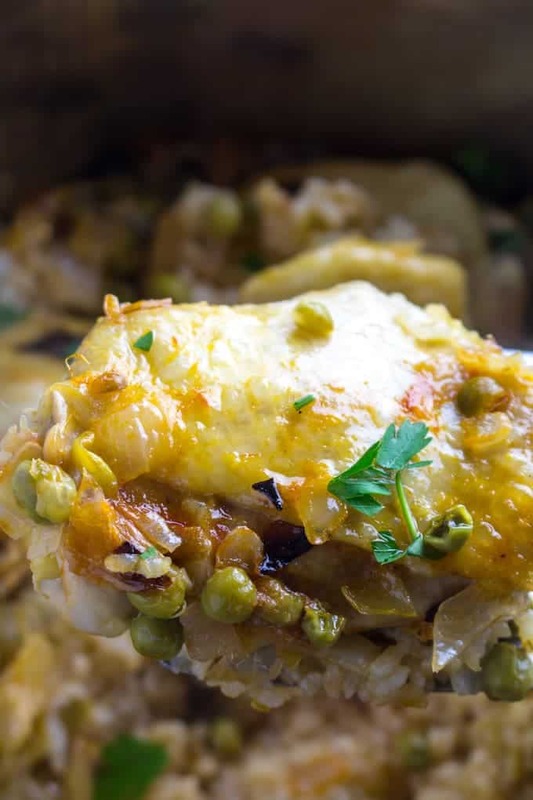 Make this recipe with potatoes instead of rice by adding washed and quartered red or gold potatoes to the bottom of the pot. Drizzle with a little bit of olive oil and salt and pepper, then place the veggies and chicken over them. Cook for 12 minutes on high, then natural release. You can use mild or hot salsa instead of medium, that’s just my personal preference based on how much heat I like. Add other seasonings like cumin, cayenne pepper, or paprika for more flavor in the Spanish rice. I like the salsa because it’s really simple, but you can technically make it with diced tomatoes and seasoning. 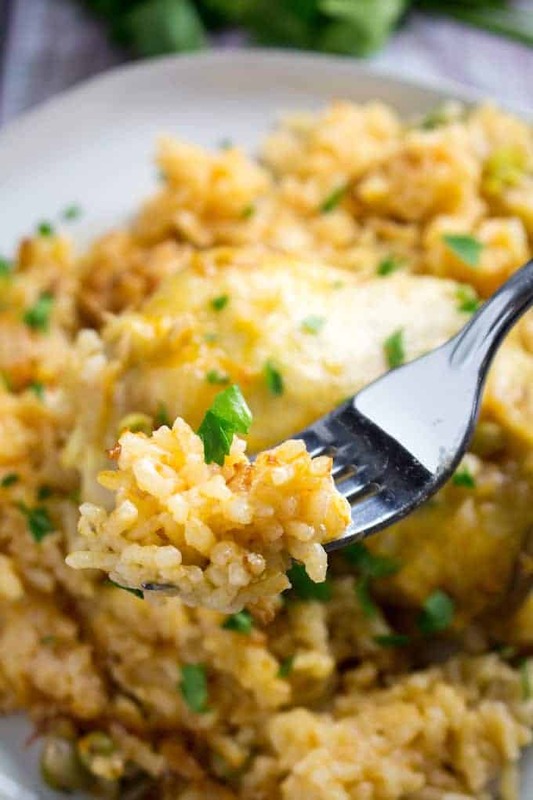 You can top your instant pot chicken and rice with a dollop of sour cream, shredded cheese, or chopped cilantro. Add some green bell pepper or poblano peppers to the rice for more veggies and flavor. The type of pepper you use depends on how much heat you like. 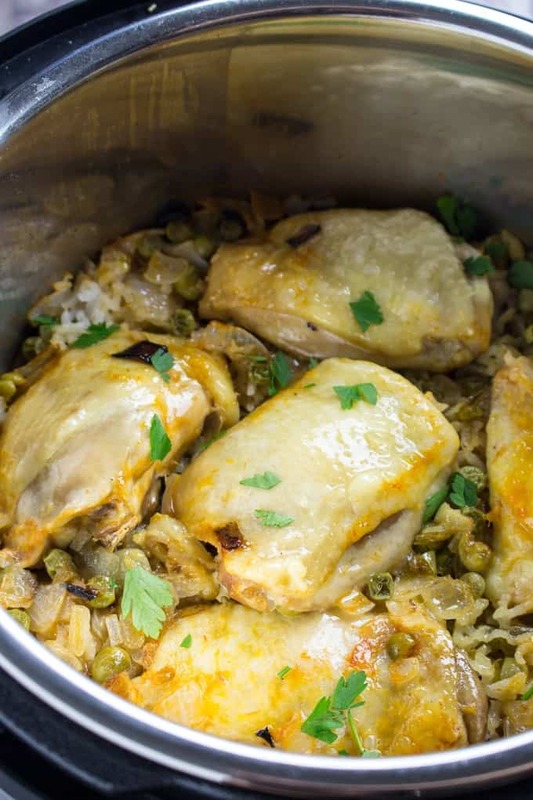 Instant Pot Chicken and Rice is a quick and easy pressure cooker dinner that's perfect for weeknights, made with rice, salsa, peas, and chicken thighs, ready in under 45 minutes! Set Instant Pot to sautee mode. Add butter and onion and sautee until onion is transleucent, about 3-4 minutes. Add rice and cook another 2-3 minutes, stirring continuously. Add salsa, peas, and broth and stir until everything is combined. 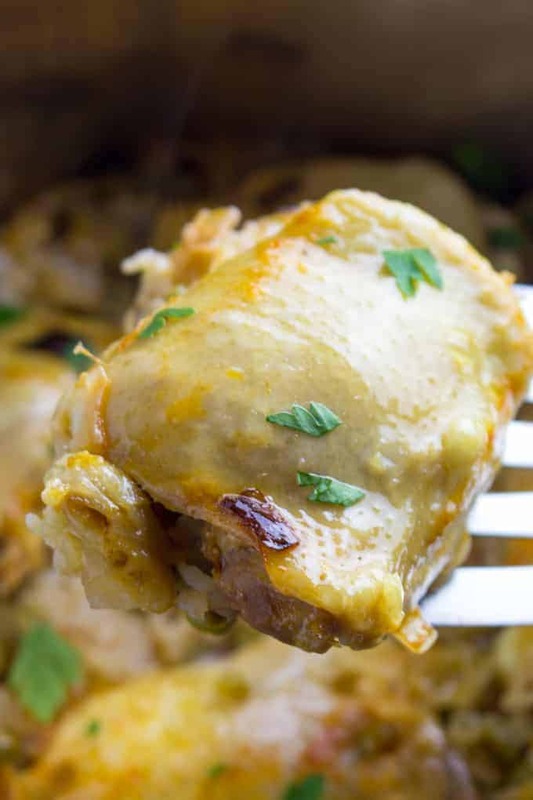 Place chicken thighs on top and close the Instant Pot lid, and shut the steam valve. Set on HIGH in manual mode for 12 minutes. Once time is up, let pot naturally release (about another 5-10 minutes).